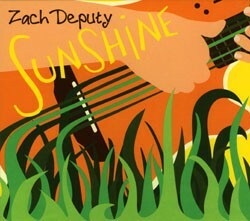 In the wake of the recent success of Jason Mraz and the “American Idol” triumph of Kris Allen, Zach Deputy has recorded Sunshine in the same safe, white, pseudo-soul, acoustic-pop-troubadour vein. Problem is, Deputy comes off too much like Mraz and Allen to really make any impact — call him the poor man’s Brett Dennen. The album kicks off with “Fresh Street,” a canned piece of funk-lite that does little to recommend the tracks to follow. And what follows is all over the place. “The Way You Make Me Feel” (not the Michael Jackson cover I had hoped for) is a bit of forced reggae. So is “Twisty Twisty” — essentially Jimmy Buffet’s “Volcano” but about a hurricane. After the beach, Deputy tries on his soul-man hat for the title track as well as “Stay” and “Dr. Doctor” (not the Robert Palmer cover I had hoped for). These tracks are better but still lightweight, covering the lyrical territory between “love you, baby” and “hey, pretty baby.” The best of this bunch is “Real,” on which Deputy busts out a sweet falsetto that had me checking the credits for a guest vocalist. Much is made in Sunshine’s liner notes about Deputy’s use of live looping during his shows — his talent as a one-man band, if you will. More than half the album was recorded using this technique, and you never get that “Wow, that’s really cool” effect that was presumably intended. Instead, you wonder why Deputy is messing up his music with a Casio drum machine. Where you do get to appreciate his guitar skills — and Deputy does have skills — are the tracks where he’s backed by a live band. Playing with other musicians, particularly Jason Cohen wailing on a Hammond B-3, augments Deputy’s sound in a warm, rich way that looping technology never could. Regardless of liner notes, you can tell from just listening to the album which songs have a full band. I hope Deputy takes his future endeavors in this direction. That said, I must admit a particular fondness for one of the band-free tracks. “Games” could very well be a Michael Jackson cover from the Dangerous era. The breathy, staccato MJ delivery and the production are so dead on, producer Teddy Riley might call to ask for royalties. I’ll certainly be interested to see if Deputy can pull this off — or any MJ dance moves — when he appears at Nectar’s every Monday in August.